W. Bro. Brian Phillips has yet again been let loose on the Triumph Tiger to raise funds for the Festival, you can find the link below to Brian’s page so please give generously. The page is now run through Grand Lodge Charity so that there is no commission taken as with the previous just giving pages. Brian’s itinerary will take him to the following destinations. 21/08/17 Worcestershire to the Isle of Man via Heysham, where he will complete 4 laps of the IoM circuit (not at 130mph average) staying overnight in Douglas. 22/08/17 Douglas to Dumfries via Heysham, Kendal, Ambleside, Cockermouth, Carlisle, Dumfries where an overnight stay will be taken. 23/08/17 Dumfries to Uig via Cumnock, Paisley, Fort William, Donnie, Big where a further overnight stay will be made. 24/08/17 Uig to Carlisle where an overnight will be taken. 25/08/17 Carlisle to Worcester via Anglesey where if Mavis is lucky she may catch a glimpse of Brian. Approximate distance for this trip is 1754 miles. Please support Brian's sterling effort with your generous contributions. Daryl is fourth from the left. 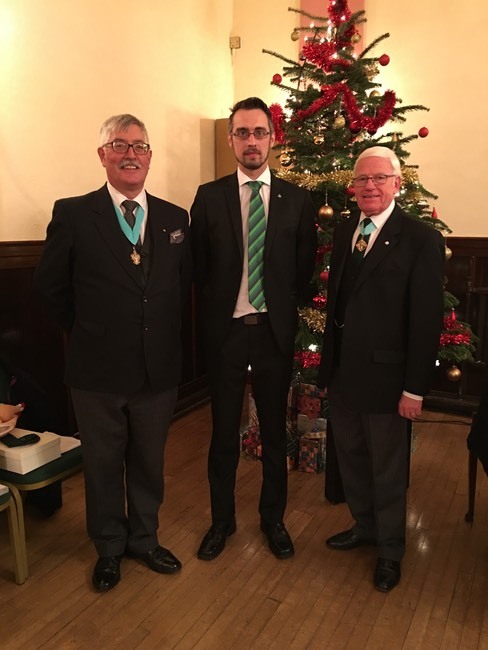 And afterwards we celebrated at the Festive Board. 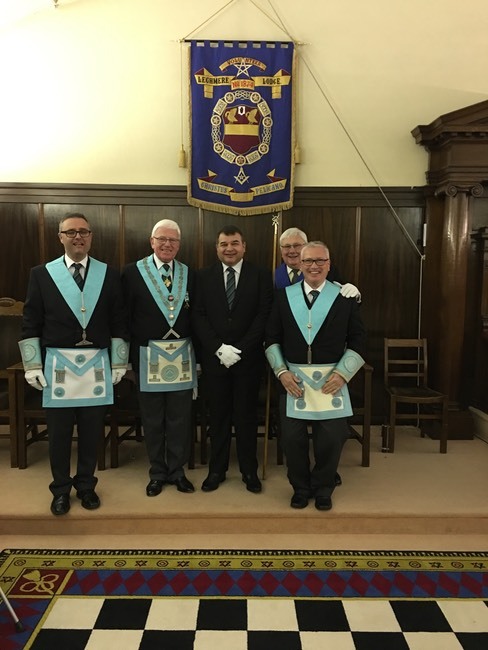 At our last meeting in April we initiated Stephen Powell, who was proposed by Bro. Bernard Patmore and seconded by Bro. Steven Corns. We had a good turnout with a large number of visitors and a good evening was had. Back row L to R Bro. Neil Harris, W.M., Bro. Stephen Powell, Initiate, W. Bro. Raymond Rooke, D.C., Bro. Anthony Sheppard J.D. And the Candidate with some of the officers. W.Bro. Raymond Rooke D.C., Bro. Dean Spencer J.W. 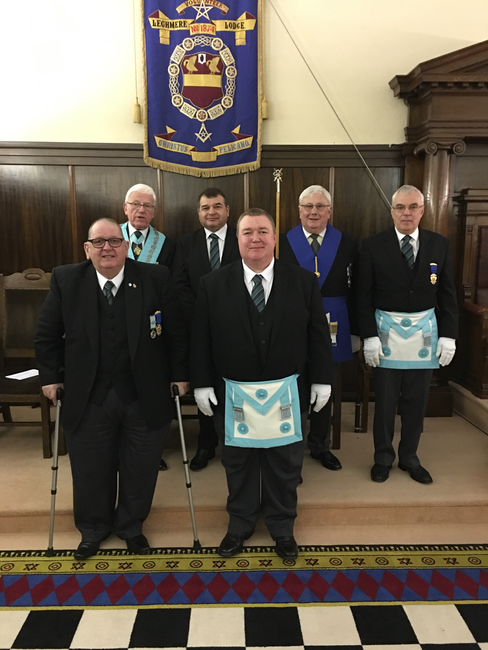 At the December meeting we were privileged to pass Bro. Cant. Darrell Robinson of Campbell Lodge No. 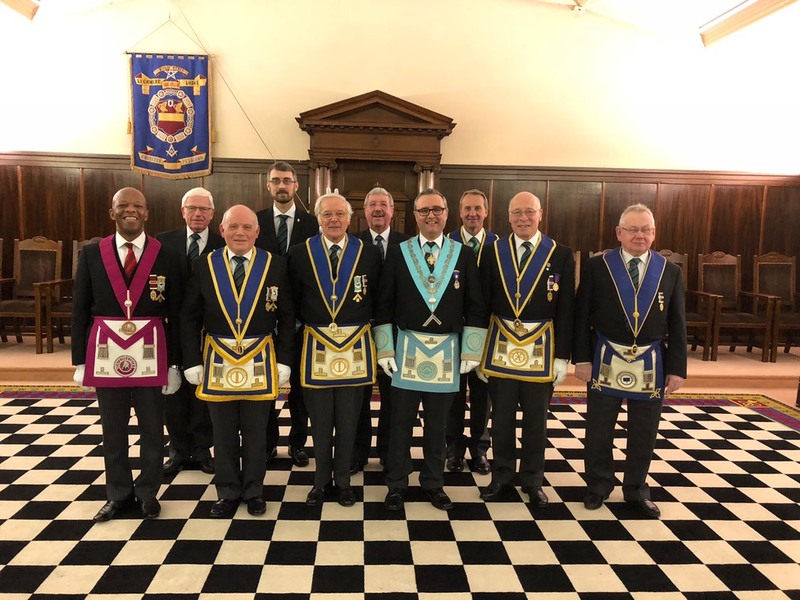 3643. pictured centre together with the Master of Campbell Lodge W.Bro. Peter Barker and the Master of Lechmere Volunteer Lodge W.Bro. Neil Harris. 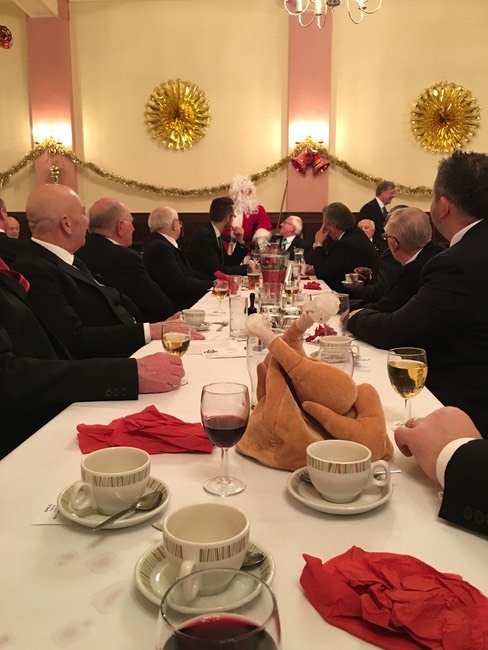 Following the Ceremony we had our usual Christmas Festive Board where we were joined by a special visitor as you can see below. 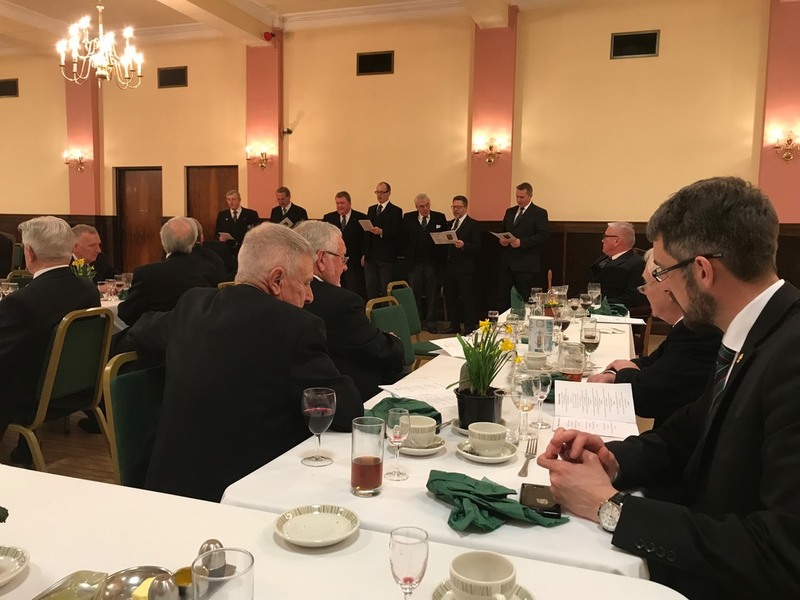 Lechmere Volunteer Lodge held there annual Ladies Evening Festival on Saturday 16th April and a Charity Appeal took place on behalf of the Worshipful Master’s wife Carol on behalf of the ACHD Unit at Queen Elizabeth Hospital Birmingham. The appeal raised a grand total of £850.00. 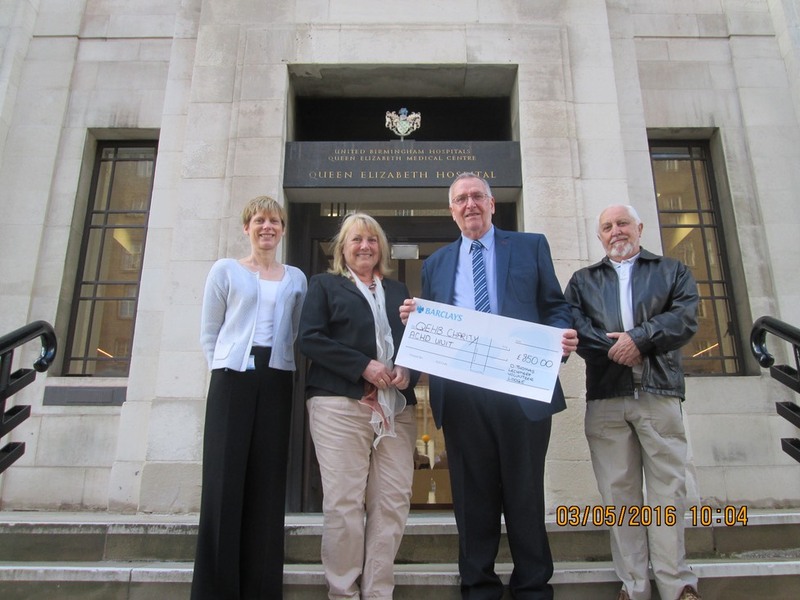 The Worshipful Master Martin Clarke and his wife Carol together with the Lodge Charity Steward Worshipful Brother Dave Thomas had the pleasure on Tuesday 3rd May of presenting the cheque to Dr Sara Thorne (pictured on the left) who thanked the Lodge for their generous donation which was gratefully received. The Ladies Evening Festival also held a raffle and raised £250.00 which was donated to each of the following Local Charites, Solihull Children’s Special Needs Association (Green Park Play Group) and Birmingham Health Mental Leisure Forum who responded with their grateful thanks.